Does anyone have any photos of the Glasgow Smailes Better banner that hung on the big gasometers at springburn when entering the city westbound on the M8???? just as a point of interest. my mates grand father was the guy who designed that logo. he tells us at every opperatunity! A Glasgow singer Maureen Hart had the song on one of her tapes. I will try and find the words. I know the one you mean ... might be on some old glasgow postcards etc. Still no sign of the new Glasgow logo then ... must be crap if it's taking them so long . have they not spent some silly amount on designing a new one, i heard something like a couple of million was spent on it. Can't say I'm impressed with the slogan , but still not seen the design of the logo yet. STYLE VICTIM After many years deliberation, and at the cost of over £2 million, Glasgow's new slogan to replace the fondly remembered but sadly outdated 'Glasgow's Smiles Better' has finally been unveiled. But already there's an orderly queue to bash the new slogan. Some argue that it seems to be taking a sly pop at the rest of Scotland, as if Glasgow's stylish and the rest of Scotland isn't? Others argued that, while Glasgow was certainly stylish, with great shopping and fashion, is it really the stand-out thing you think of when you think of Glasgow? But I reckon it's just a bit rubbish as a phrase. It doesn't sound good, and it doesn't mean much. Don't you kind of know Glasgow's in Scotland? And anyway, since when did cities need slogans? What for? "Scotland with Style" is rubbish... really really rubbish, and will only ever be remembered as being rubbish! 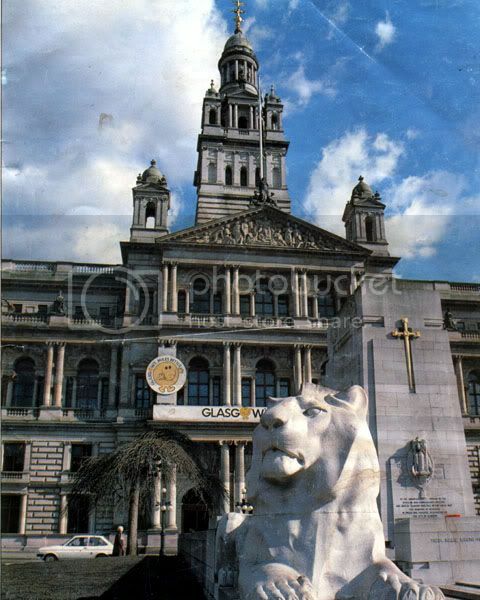 Anybody remember "Glasgow's Alive", which followed on from Miles Better? It won a 45,000 pound competition, would you believe. Or do you remember the cartoon in Electric Soup comic of "Glasgow's a Dive". Ronnie wrote: Anybody remember "Glasgow's Alive", which followed on from Miles Better? It won a 45,000 pound competition, would you believe. Or do you remember the cartoon in Electric Soup comic of "Glasgow's a Dive"
Nice one Ronnie, Electric Soup was the business . I have every issue bar 1&3. Superb draughtsmanship by Glasgows finest cartoonist Frank Quitely. I think he's one of the leading artists for DC comics in the USA now. Doing 2000AD comics. His parody of "The Broons" has to be seen to believed. Quitley's toons were called "The Greens" and it had every family member down to a tee, but in a totaly inverse situation. What about "The Wildebeast's"? or The Bears Fae Brig'ton to name but a few. Too bad they Sold out to the VIZ people after only a few issues, They should have stayed put in Parnie Street and not sold out. Found this proudly on display but not in Glasgow. My friend's dad used to have one of those stickers on his car bumper, but he had added a 'W' on top so it read "Glasgow's Miles Wetter!" I had one on my cars for nine years when I lived in Australia, lovingly moved from one car to another. I also had a Daily Record one that said "I belong to Glasgow" - used to see others that said Paisley, Clydebank etc. This is where I remember it best being displayed - not the ideal pic, alas, but best I can do! I've still got the badge but has anyone got a T-shirt, mug etc?